What Tools Are Used During Treatment? The HydraFacial tools consist of the HydraFacial machine itself, and a sterilized tip for the machine. A warm cloth is used to clean the face and we perform a Glycolic peel and use a comedone extractor for whitehead, milia, or blackhead extractions. Are HydraFacials Actually Good For Your Skin Or Can They Do Harm? HydraFacials are good for the skin. They exfoliate the skin in a way we cannot do manually, and they also hydrate the skin simultaneously. Thus, revealing clean, clear, glowing skin. How Often Should You Get This Done? We recommend treatments once per month, but this can be tailored to any budget and may change based on your skin type. What Results Should I Expect And How Long Will They Last? You can expect a brighter, fresher appearance post treatment, which can last 1-2 weeks. What Do I Need To Do After Treatment To Prolong Positive Effects? A good skin care regimen of cleansing, moisturizing, and sunscreen daily is very important. Any time you are exfoliating, revealing the bright, fresh skin underneath, sunscreen is necessary for protection. The HydraFacial is not painful at all! HydraFacial is safe for sensitive skin because the machine is highly adjustable to suit all skin types. We can adjust the machine’s suction level to accommodate all patients, and we can change certain light peels that we perform based on your skin type. Does It Help Acne And Acne Prone Skin? HydraFacials are great for acne because the suction of the machine cleans pores of dirt and debris. At the same time, it also infuses acne eliminating products like Salicylic Acid. Does This Help With Acne Scarring? The HydraFacial is not a treatment for acne scarring, but it does keep future acne at bay. Can You Have This Treatment If You Are On Isotretinoin? Yes, you can have a HydraFacial when you are on Isotretinon/Accutane, the treatment can be adapted to Isotretinoin patient’s more sensitive skin. Side effects can be pinkness and the occasional irritated blood vessel, but most people leave glowing. Do I Need To Do Anything Specific After Treatment? As an esthetician, I advise my patients to be gentle when cleansing their face for the first time post treatment. I usually advise no harsh chemicals or Retin A for 1-2 days post treatment. What Age Group Benefits Most From This Treatment? All age groups benefit from a deep cleansing HydraFacial. The HydraFacial infuses hydration into the skin and can improve the appearance of wrinkles temporarily, but it is not a “wrinkle treatment”. Is This A Once Off Treatment, Or Do I Need Multiple Treatments? Results of exfoliated, hydrated, fresh skin are apparent after each treatment. However, patients who get treatment regularly can maintain a fresher complexion, and acne patients have a diminished chance for serious breakouts. I Have Pigmentation On My Face, Will HydraFacials Help Or Worsen It? HydraFacials do not improve pigmentation and it will not worsen pigmentation. It is not a treatment for this condition. Treatment takes 30-45 minutes, depending on any peels or extractions performed by the individual esthetician. What Do I Do To Prepare My Face Before Treatment? Thorough removal of makeup is helpful prior to treatment. Do HydraFacials Work Better On Certain Skin Types And Complexions Than Others? HydraFacials are effective on all patients. What Ingredients Are In HydraFacials? Peptides, antioxidants, and Salicylic Acid are some of the ingredients in HydraFacials. HydraFacials are not organic. Chemicals like Salicylic acid can be used with the HydraFacials machine. However, we can substitute more gentle ingredients for a pregnant, extremely sensitive, or allergic patient when needed. Can I Use DIY Facemasks And Face Mask Sheets After Treatment? DIY face masks can be used if desired, however, I recommend waiting 2-3 days post treatment. Some patients can break out after any facial treatment or change in skincare routine. It is not the norm with a HydraFacial treatment. Men can absolutely get and enjoy HydraFacials! 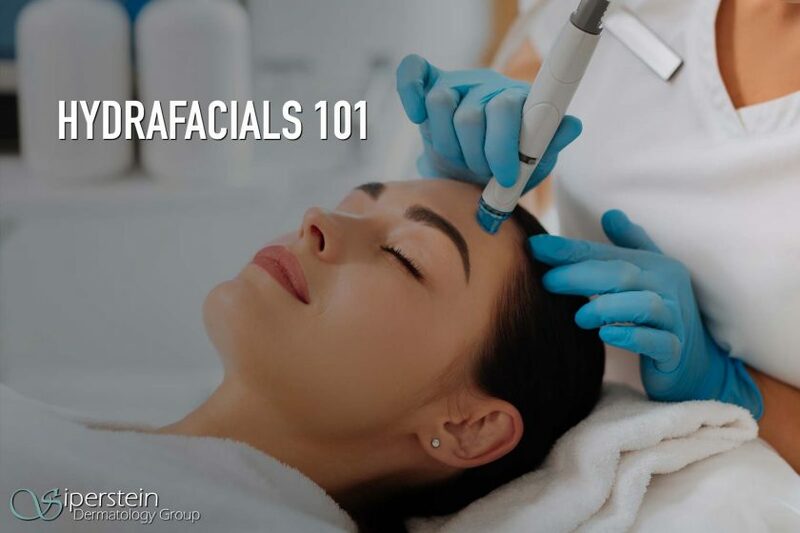 It is important that they shave closely in order for the whole face to be treated, or for patients with beards, a HydraFacial can be done on a partial face. Should I Wear Aftershave After Treatment? I recommend skipping after shave for 24 hours post treatment. Should I Stop Wearing Make Up After Treatment For A Few Days? HydraFacials at our practice are $155.00 for 30 minutes, $175.00 for 45 minutes. Investing in a good treatment regimen will ensure that your skin keeps getting better. Get your glowing skin with a Hydrafacial today! Call Siperstein Dermatology Group to schedule an appointment or a free consultation at (561)-364-7774.